Minor Bupleurum Combination (Xiao Chai Hu Tang) has a wide range of application in the clinic, and is recorded numerous times in the “Shang Han Lun” and “Jin Gui Yao Lue”. TCM practitioners use Minor Bupleurum Combination (Xiao Chai Hu Tang) to treat a large number of illnesses in a wide variety of departments, including internal medicine, external medicine, gynecology, ophthalmology and otorhinolaryngology. Minor Bupleurum Combination (Xiao Chai Hu Tang) can be used to treat a viral cold with a persistent high fever, ruddy complexion, diaphoresis, mild aversion to cold, and cough or sore throat; in such cases add 1 liang of Forsythia Fruit (Lian Qiao). For swelling and pain in the joints due to rheumatoid arthritis, with morning stiffness, add 8 qian of Forsythia Fruit (Lian Qiao), 8 qian of Raw Rehmannia (Sheng Di Huang), 3 qian of Phellodendron (Huang Bo), 4 qian of White Peony (Bai Shao), and 3 qian of Licorice (Gan Cao). Minor Bupleurum Combination (Xiao Chai Hu Tang) can also be used for allergic dermatitis, urticaria, or atopic dermatitis with symptoms that come and go. In addition Minor Bupleurum Combination (Xiao Chai Hu Tang) has been used to treat alternating fever and chills in patients who are sensitive to wind and cold by adding 3 qian of Schizonepeta (Jing Jie), 3 qian of Saposhnikovia (Fang Feng), 1 liang of Gypsum (Shi Gao), and 5 qian of Forsythia Fruit (Lian Qiao). For bronchitis, or persistent cough that is unresponsive to antibiotics, add Schisandra Fruit (Wu Wei Zi) and Dried Ginger (Gan Jiang). Minor Bupleurum Combination (Xiao Chai Hu Tang) can also be used for those with hyperactive thyroid or thyroid tumors and symptoms of fullness and discomfort in the chest muscles, in such cases add Oyster Shell (Mu Li), Anemarrhena (Zhi Mu) and Scrophularia (Xuan Shen). Some cases of spontaneous hearing loss, middle ear infections and myringitis in those with glandular constitutions can be treated with Minor Bupleurum Combination (Xiao Chai Hu Tang) plus Forsythia Fruit (Lian Qiao), and Gardenia (Shan Zhi Zi). 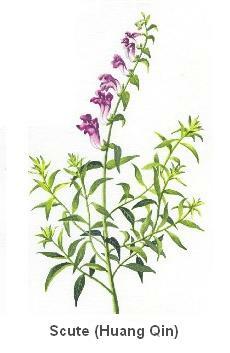 In formulas where large doses of Licorice (Gan Cao) are necessary, adding Alisma (Ze Xie) and Poria (Fu Ling) should be added to prevent edema and improve results. Minor Bupleurum Combination (Xiao Chai Hu Tang) can be used in combination with other formulas to address a wide variety of problems. For those patients who seem notably despondent and have plum pit qi, combine with Pinellia & Magnolia Combination (Ban Xia Hou Po Tang); this formula is called Bupleurum & Magnolia Bark Combination (Chai Po Tang). In cases where the patient is weak, perspires, and is sensitive to wind (nutrient and defense disharmony), combine with Cinnamon Combination (Gui Zhi Tang) to make Bupleurum & Cinnamon Combination (Chai Hu Gui Zhi Tang). Minor Bupleurum Combination (Xiao Chai Hu Tang) can also be combined with Minor Trichosanthes Combination (Xiao Xian Xiong Tang) in cases of pneumonia with cough, copious thick yellow phlegm and a painful pressure in the center of the chest. 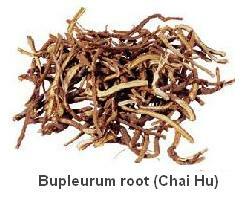 This formula is called Bupleurum & Trichosanthes Combination (Chai Xian Tang). For patients with edema or watery diarrhea, combine with Hoelen Five Herb Formula (Wu Ling San), and this is known as Bupleurum & Hoelen Combination (Chai Ling Tang). In patients with pneumonia who present with a thick white tongue coat and lack of appetite, combine with Magnolia & Ginger Formula (Ping Wei San) to make Bupleurum, Magnolia, and Atractylodes Combination (Chai Ping Jian). Minor Bupleurum Combination (Xiao Chai Hu Tang) can also be used in urinary tract disorders such as prostate cancer where urination is inhibited and blood is present. In such cases add Polyporus Combination (Zhu Ling Tang). Currently many people are using Minor Bupleurum Combination (Xiao Chai Hu Tang) to treat influenza with fever as well as treat hepatitis, and in China the formula has been made into a patent medicine of soluble granules. Using this formula as an antiviral would be outside its scope of treatment, because Minor Bupleurum Combination (Xiao Chai Hu Tang) is not able to directly kill viruses but rather deals with viruses by strengthening the immune system. There are case studies in Japan, where Japanese practitioners prescribed Minor Bupleurum Combination (Xiao Chai Hu Tang) to AIDS patients for three months, tests showed an increase in T-cell count. This is evidence that Minor Bupleurum Combination (Xiao Chai Hu Tang) can be effective in helping to prevent AIDS pathology, and pharmacology research has shown that Minor Bupleurum Combination (Xiao Chai Hu Tang) is able to strengthen immunity. Most of the harm inflicted on the body by viruses is through damage done to the immune system. One example was the devastating effects of SARS, which attacks the immune system. It is by way of the immune system's reaction to the virus that irreversible damage is done to the lung, the main site of pathology. 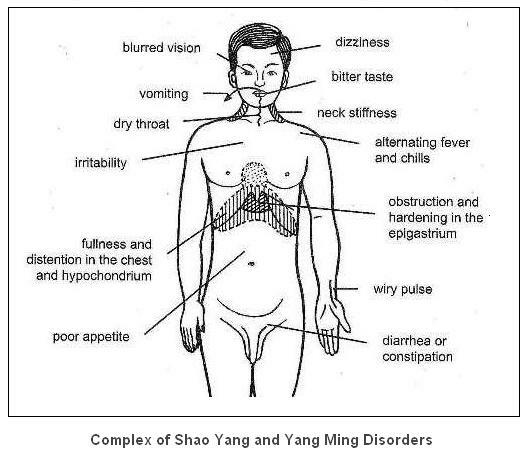 Symptoms include high fever and difficult breathing, which resemble the Minor Bupleurum Combination (Xiao Chai Hu Tang) pattern of fullness and discomfort in the chest and ribsides, and feverishness. It seems then that Minor Bupleurum Combination (Xiao Chai Hu Tang) may be a good choice as a base formula in treating SARS. Major Bupleurum Combination (Da Chai Hu Tang) is designed to regulate the Shao Yang, liver and gallbladder as well as Yang Ming, the motile function of the stomach and intestines. From its medicinal effects we can deduce that Major Bupleurum Combination (Da Chai Hu Tang) pattern includes reverse peristalsis in the digestive tract, and even vomiting. Consequently, Major Bupleurum Combination (Da Chai Hu Tang) can be used to treat gastritis associated with bile reflux, esophagitis, and post gastrectomy dumping syndrome, all of which manifest with reverse peristalsis as well as rebellious stomach Qi, reverse flow of liver and gallbladder Qi, and obstruction. 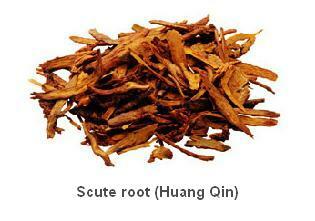 If the patient is vomiting relentlessly add Pinellia Rhizome (Ban Xia) and Fresh Ginger (Sheng Jiang). Major Bupleurum Combination (Da Chai Hu Tang) uses 8 qian of Fresh Ginger (Sheng Jiang) which shows that relentless vomiting is a very serious condition. Comparatively, Minor Bupleurum Combination (Xiao Chai Hu Tang) uses only 3 qian of Fresh Ginger (Sheng Jiang) and treats heart vexation and frequent vomiting, a less severe condition. Major Bupleurum Combination (Da Chai Hu Tang) contains Rhubarb (Da Huang) and Zhi Shih (Zhi Shi), which are herbs that promote normal peristalsis of the digestive system. 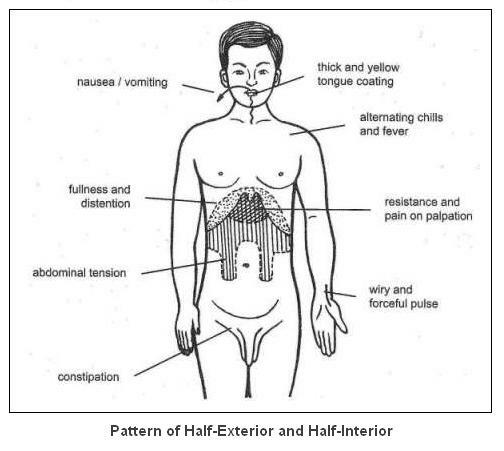 This is why Major Bupleurum Combination (Da Chai Hu Tang) can alleviate symptoms of reverse peristalsis. If the problem of reverse peristalsis is not resolved properly, the patient will begin to vomit frequently. And once that happens no matter how you modify the formula, it won't be effective. Major Bupleurum Combination (Da Chai Hu Tang) contains Zhi Shih (Zhi Shi) and White Peony (Bai Shao) which themselves make up Aurantii and Paeoniae Combination (Zhe Shi Shao Yao San). These two herbs are used to stop abdominal spasms and consequently, prescribed for women with abdominal pain, heart vexation, and abdominal fullness with inability to fall asleep. Zhi Shih (Zhi Shi) treats the area below the heart; evidence of this is in the indications for the formula Aurantii & Atractylodes Combination (Zhi Zhu Tang). Consequently Major Bupleurum Combination (Da Chai Hu Tang) is part of the Bupleurum group of formulas for treating the liver and gallbladder, resolving spasms and settling pain. When jaundice occurs in diseases of the liver and gallbladder it is important to add medicinals that benefit the gallbladder. In this case, Red Peony (Chi Shao) should be used and in larger than normal amounts. After collecting, organizing and analyzing research papers on Major Bupleurum Combination (Da Chai Hu Tang), I have discovered that this formula is most commonly used for infectious diseases of the liver, gallbladder and pancreas, and choleocystitis in particular. Following is the case study of a 36-year-old woman from September 21st, 2002. Three years previously the patient had frequent attacks of upper abdominal pain, which after undergoing an ultrasound was determined to be the result of choleocystitis, hepatitis, and a hepatic cyst. During that time, she took both Western medicines and Chinese patent medicines, but they provided only periodic relief. She had come in at this time because she had been experiencing pain for a month. The patient was of moderate build with a slightly dusky complexion and coarse skin. She complained of upper abdominal pain, lack of appetite, bitterness in the mouth, vexation during sleep, abdominal bloating, sloppy stools 2-3 times per day, and lassitude. Her tongue was red with a yellow coating, and her pulse was wiry. Abdominal diagnosis revealed a flat abdomen, with pain in its upper aspect upon palpation. There was resistance in the abdomen when pressed and her lower abdominal muscles were tense. She also had discomfort when pressure was applied to the area below her ribs. Prescription: Bupleurum (Chai Hu) 12g, Scute (Huang Qin) 10g, Processed Pinellia Rhizome (Zhi Ban Xia) 10g, White Peony (Bai Shao) 10g, Processed Rhubarb (Zhi Da Huang) 5g, Fresh Ginger (Sheng Jiang) 3 slices, Jujube (Hong Zao) 6 pieces. The patient returned after seven days and said that she felt noticeably better after taking the herbs. Her energy had improved; her bowel movements were formed and had decreased to once per day. After 14 more doses of the same formula all of her symptoms had resolved. Although abdominal bloating and pain are not symptoms generally related to high cholesterol or being overweight, people with these symptoms are often of a solid, heavy build, said to be of a solid fat body type. The abdomens of these people are often firm and feel strong to the touch when pressure is applied. If such patients are suffering from mental/emotional conditions such as insomnia and vexation as well as constipation then this formula is applicable. Recent medical research has found that Bupleurum (Chai Hu), Scute (Huang Qin), and Rhubarb (Da Huang) all have the ability to lower blood cholesterol. The ability of Rhubarb (Da Huang) to lower cholesterol may be its ability to prevent fat absorption in the intestines. When using this formula to treat high cholesterol or obesity, Alisma (Ze Xie) and Hawthorn Fruit (Shan Zha) should be added. However, in order for the formula to be effective, it needs to be taken for a long period of time, usually around 2 months, and controlling food intake is of course essential. When taking this formula to lower cholesterol or lose weight, it is very important to assess the patient's body type. Those suitable for use of Major Bupleurum Combination (Da Chai Hu Tang) usually have short necks, wide shoulders, a large chest measurement that is equal to the measurement of their lower ribs and an abdomen that is firm and strong to pressure. Major Bupleurum Combination (Da Chai Hu Tang) has a muscle relaxing effect, so is suited for those with a tense body type. It is not suited for those with so-called “depletion fat”, those with soft flabby body types. Because it contains Rhubarb (Da Huang), the question arises: must a patient have constipation to use Major Bupleurum Combination (Da Chai Hu Tang)? Not necessarily. Zhang Zhong Jing mentions “xia li”, diarrhea, in relation to this formula and not constipation. This formula can also treat bacterial dysentery, so the function of Rhubarb (Da Huang) is to drain heat not merely to free the stools. When Zhang Zhong Jing uses Rhubarb (Da Huang) for the purpose of purging and freeing the stools, most often he recommends using it in large quantities, untreated, or added at the end of decocting. However, when using Major Bupleurum Combination (Da Chai Hu Tang), it is not necessary to use Rhubarb (Da Huang) in large doses, or add at the end of decocting. It is not to be used in doses for purging. If a patient has constipation slightly larger than normal, doses of unprepared Rhubarb (Da Huang) can be used, but if there are no signs of constipation, then small doses of treated Rhubarb (Zhi Da Huang) should be used. 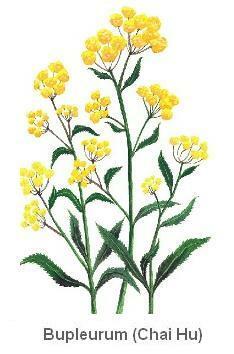 There are many other uses of Major Bupleurum Combination (Da Chai Hu Tang), for example, heart-vexation, insomnia, impotence, diabetes, gout, and high blood pressure. As long as the patient has a strong, solid body type and pressure on the region below the heart feels full and induces pain, this formula can be used. Another one of the Bupleurum formulas from Shang Han Lun is Bupleurum, Cinnamon Twig, and Ginger Decoction (Chai Hu Gui Zhi Gan Jiang Tang). A harmonizing formula that is beneficial for those people with weak glandular constitutions. Bupleurum, Cinnamon Twig, and Ginger Decoction (Chai Hu Gui Zhi Gan Jiang Tang) contains Bupleurum (Chai Hu), Trichosanthes Root (Gua Lou Gen), Scute (Huang Qin), Oyster Shell (Mu Li), Dried Ginger (Gan Jiang), Licorice (Gan Cao), and Cinnamon Twigs (Gui Zhi). Clinically it can be used to treat menopausal problems, vascular problems, insomnia, psychological disorders, athletes foot, tuberculosis, and pleurisy. Signs and symptoms that this formula treats include nervousness, chest fullness and discomfort, abdominal pulsations, palpitations and excitability, perspiration on the head or night sweats, remittent fever (external patterns), as well as insomnia, mild thirst (no signs of nausea), soft stools, anemia, slight feverishness, chest and abdominal repletion, exterior depletion heat with internal cold, insufficient body fluids or signs of lacking of water, reduced urination, tense abdominal muscles with and a feeling of Qi surging upward from the abdomen. Another formula, Bupleurum & Mu Li Combination (Chai Hu Jia Long Gu Mu Li Tang) is used to treat a restless spirit, insomnia, and palpitations. The Bupleurum (Chai Hu) family of formulas is a versatile group of formulas with a wide range of application, including digestive, nervous and immune disorders, respiratory ailments and gynecological disorders. Minor Bupleurum Combination (Xiao Chai Hu Tang) also has an immune boosting effect that has the potential to be very useful in treating contagious diseases. Having been originally designed to treat Shao Yang/Yang Ming disorders makes Major Bupleurum Combination (Da Chai Hu Tang) ideally suited to treat digestive disorders, particularly those that involve problems with peristalsis, as well as various conditions of the liver and gallbladder. The author of this article is a retired TCM practitioner. He is now doing research on ancient documents of traditional Chinese medicine.